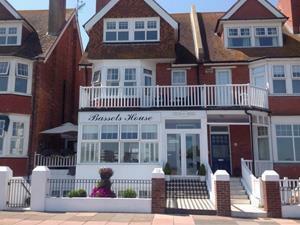 Bassets House sometimes limits bookings to 2 or more days. 1.Double Ground sometimes limits bookings to 2 or more days. Medium-sized twin beds room, en-suite with rear garden view and balcony. 2.Twin Ground sometimes limits bookings to 2 or more days. Large sized front facing room, direct sea view; en-suite, one King bed and one Single bed, plus two large wicker armchairs. 6.Family Second sometimes limits bookings to 2 or more days.